I stamped the flower on a large white scrap, masked it, and stamped two more flowers around it. I then placed my oval cutting template (CM) on top and cut out the oval except around the flower petals. I hand cut around the flowers, so it looks like they are floating off the edge of the oval. I colored the flowers with copics, matted it on a black oval, and attached it with dimensionals to the black/white/rock dsp/black gingham base. An oval sentiment finishes it up! I kept this card relatively simple, but you could kick it up a notch with some brads in the corners. 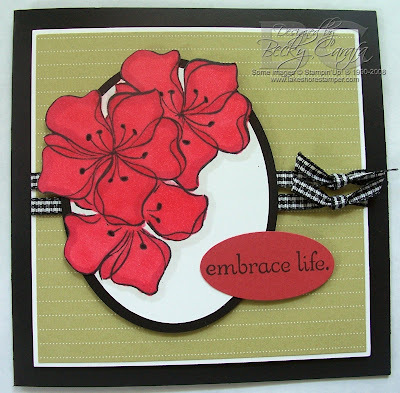 What a gorgeous card...you used one of my favorite color combos- love it! This is gorgeous Becky, the colors are fabulous!! great card. love the flowers and the out of the box technique. Stunning card...the colors are perfection! I already said this on the CAS blog, but I just love this card. It's gorgeous! Very pretty! The colors are fabulous. This is beautiful Becky! I love how the flowers are coming off the layer! TFS!